This year marks the 25th anniversary of the Needler’s Retreat and I’m so glad to be able to be a part of it. Once again, we’ll be meeting at The Glen House in Gananoque; a beautiful venue and so welcoming. Our classes this year are another good mix and I’m especially excited to be taking a class that my BFF, Francine Hebert of Fancy That will be teaching on the knitting with silk hankies technique. Our class materials will include hankies that have been dyed by my friend Yvie of YvieKnits, so this promises to be a real treat. A trip back in time: Needler’s Retreat 2011 photos. Our other workshops will include: JAZZ UP YOUR RAGLAN by adding Stitch Patterns with Deb Gemmell and KNITTING CONTINENTAL COMBINED with Anja Krebber. No homework required this year so I’m a very happy girl! I’m hoping to be taking the “Tipsy Lizzy” (Elizabeth) shawl and my finished “Oliver Twist” shawl, provided I can get them blocked and dry before we head out Friday morning but I’m not going to drive myself crazy trying. I’ve learned this last year to take things a little easier. I’ll post if able, the days are very full and there are some beautiful venues for walks and photo ops. If not, there’ll be an update next week. Wishing you all a great week and weekend. Cheers! 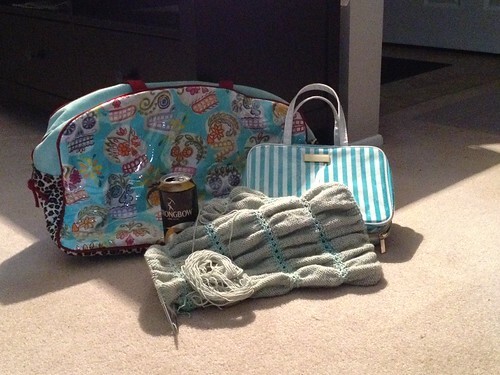 This entry was posted in Classes, Retreats and Workshops, Crochet, Knitting, Life and Stuff, Random and tagged Crochet, Gananoque, Knitting, Needler's Retreat, Oliver Twist Mystery KAL, Sheeps Ahoy, The Glen House, Tipsy Lizzy Shawl. Bookmark the permalink.